8:30pm Bedroom. Scottie and Brett. They’re talking about the Zinbot. Brett – I want someone to cry. I hope someone cries. The conversation turns to talking about the app punishments. 8:40pm Brett is studying the facts for the HOH competition tomorrow. Storage room. Tyler and Kaycee. Tyler – I’ve been hanging out with Fes a lot. Rachel said I should probably be studying with Fes. 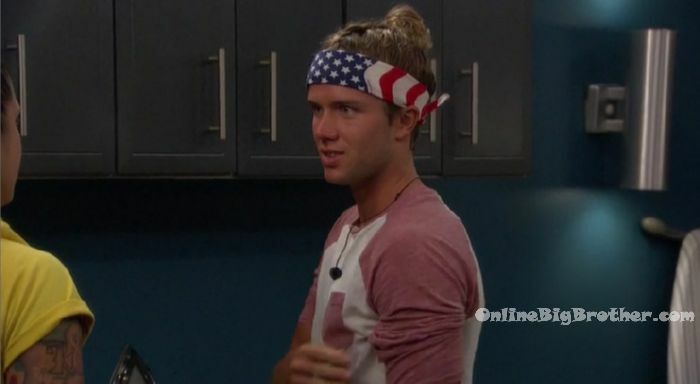 Kaycee – Did you hear what Brett is going to do for his speech. Tyler – yeah, that’s f**king amazing! 9pm Havenot room. Brett and Fes. Fes – Tyler is good with everyone. Have you pitched to Tyler? Brett – I gave him a part of a pitch. Fes – if you can get them two, then Iwoud be on board. Fes – you would need JC and Sam. Brett – we’re cohabitating and to cohabitate with the sh*t that she does. She is a 30 year old going on 13! F**king screams like a child. Leaves dishes everywhere. The only thing she is capable of cooking is eggs and I’m not even talking eggs Benedict where its impressive, I’m talking burnt a$$ scrambled eggs and then she leaves the dishes on the counter. Fes – she does get super paranoid. Brett – she is a liability. Brett – that’s what you need to think about .. who will add to my game. She is a liability and she stirs sh*t up. She is up and down to the HOH every five minutes. Who is going to build you up and who is going to drag you down? Fes – if we get the votes to keep you. I keep you. I know where you stand with the guys but like with the girls? Brett – I have no opposition with the girls. I am willing to work with anything. Only Rockstar wants to rip my nut sack off. Fes – I believe you if you stay and win HOH, that you wouldn’t put me up. Fes – we’re the top dogs going after other top dogs and they’re sitting around doing nothing. Brett – I deserve to be here and there are some people that don’t do anything. Rachel is running around making multiple final 2 deals. Fes – She hasn’t made one with me. How do you feel about Angela and Kaycee’s vote? Brett – My feeling is that they’re voting with Rachel. Fes – what about Sam and Haleigh? Brett – Sam is a f**king curve ball that is going to do w what she wants. Fes – how did your talk go with Bay? Brett – I feel like she would be fine with whoever goes, goes. 10pm Sam and Bayleigh. Bay – someone gave me word that there might be a verbal attack tomorrow and I hope there won’t be. Someone said that Brett is going to try and get Rachel to snap tomorrow. As like his last attempt to stay here like he did last with last time with Rockstar. Bay – it depends on what type of speech he decides to do. And they’re friends so I hope he wouldn’t. I want everyone to just respect each other. Sam – have you asked Brett not to do that? Bay – I didn’t hear it from him. I want him to decide what to do and not to do. At the end of the day I hope he decides not to do it. Sam – that bothers me. Bay – the traps that you set for people are the ones you will fall into first. 9:27pm Havenot room. Fes and Scottie. Fes – his biggest pitch was that he deserves to be here and Rachel is a liability. He was saying that Rachel doesn’t do anything around the house. I get that but that’s not why I would vote to keep you .. because you cook. This is a game. We can always get Rachel out. He isn’t really with us. If I keep him because I think he might vote for me, I might not even get there so why worry about it. Fes – do you think its going to be unanimous? Scottie – I think 8 – 1. Fes – so as long as you, me and Tyler .. JC is going to vote with the house. Brett’s pitch is that we’re all comp beasts. He’s not a comp beast!? He hasn’t won anything so I don’t know why he keeps saying that. Scottie – he’s grasping at straws. Fes – he keeps repeating the same stuff. Scottie – make him feel like he has a chance so that he doesn’t blow up on Rachel. Fes – she (Rachel) isn’t winning that memory comp tomorrow anyways. 10:32pm Havenot room. Scottie and Tyler. Tyler – I just don’t want f**king Rachel around. Scottie – take her out next week. Brett this week and Rachel next week. Tyler – I’m down. Scottie – she has even been throwing Kaycee and Angela under the bus. She’s been saying they don’t do anything and they don’t deserve to be here. Tyler – they’re her closest people. Scottie – so if they ask tell them that she said they don’t deserve to be here. Tyler – I’m into that and then she is here next week and they target her. Scottie – but don’t pitch it until after the HOH. Me, you and Fes are voting for Brett to stay. We’re voting her to stay, Sam is, Fes is, Kaycee and Angela.. that’s literally everyone. Tyler – I need to talk to Rachel tomorrow to clear things up with her because I know she is saying stuff about me. 11:10pm HOH room. Bay, Haleigh and Fes are studying. 11:40pm Bedroom. Angela and Brett are studying for the HOH competition. 12:10am Havenot room. Scottie, Tyler and Fes are studying. 12:48am – 1:15am Fes and Rockstar studying in the bathroom. All the other house guests are sleeping. Fes – if you won HOH would you still take Angela or Kaycee out the backdoor? Rockstar – I would talk to you guys about it. Tyler is also really good at everything. He’s not in our final five. You know who else isn’t in our final five? Fes – Scottie? Rockstar – no Scottie is. Rockstar – JC. Fes – but do we need to worry about Tyler and JC this week? Rockstar – I don’t know. Fes – other people are going to take shots at Tyler and JC. Rockstar – I don’t think anyone is going to take a shot at JC. When it comes to Sam and JC they will beat everyone because everyone loves them. It doesn’t have to be now but it does have to be at some point. They have to go. Fes – JC – isn’t going to make to top three. 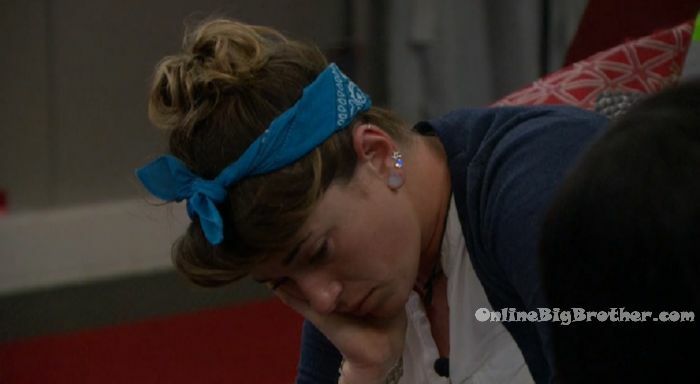 Fes – I don’t want Angela and Kaycee to vote their way to top five .. and not f**King do sh*t .. with everyone avoiding their a$$. Rockstar – I agree. I totally agree. I love Sam but she is kind of my target. Not because she put me up but because I would never beat her. Fes – other people feel that way too .. do you want to be the one to take the shot. If Angela wins you and I are probably going up. Rockstar – Haleigh would put up Kaycee. 1:30am Kitchen. 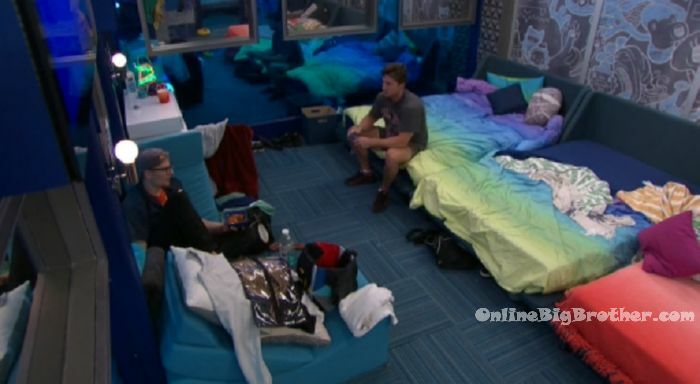 Sam, Brett, Rockstar and Fes are awake now chatting / eating. 1:50am – 2:26am All the cameras are on the house guests sleeping..
Can I just say…..I miss Granny. Simon and Dawg, she’s you’re perfect “third”. That said, I hope she’s having a fabulous cruise! Thanks again Simon and Dawg for all you do, I’m here every year and wouldn’t miss it for the world! Awesome season, as we’ve all said…and I can’t wait for tonight! Wheeeeeee! I fully expect Scottie or fess to win this comp. Last night Scottie was called into the Dr and had to turn over a piece of paper he had written details about the videos. 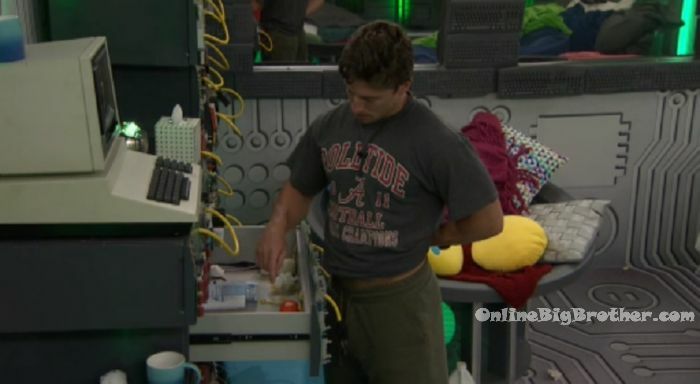 Fess was in the HOH writing on paper with an eyeliner with a blanket trying to cover him. I hate cheaters. Wow, if that’s true then they shouldn’t even be able to play in the HOH. They shouldn’t be allowed to participate in the comp!! I believe the rule is no one is allowed to write stuff. It’s mostly to avoid them colluding with each other and production not have audio of the interaction so they can put their spin on it. They’ve always told them they can’t take notes though. It’s why pens and pencils are not allowed. That has always been my understanding. Hamsters of BB past have come up with creative ways to study for memory comps like using candy and play-dough. I have a vague memory of Skittles being used to study for days of events. I’m 99% sure that actually writing things down has never been allowed. If that’s the rule, they broke it, giving themselves an unfair advantage. They should be penalized appropriately though I doubt they will. BB leans toward using the “slap on the hand” method of punishment. Disclosure: I don’t want Scottie or Fes to win HOH so my opinion might be considered biased! ? There is a specific rule I believe for the whole house that writing anything down is forbidden. Brett is going to be the next HOH. I agree with you. I come here for Simon and Dawgs updates not her. no one said you have to read her comments, move on! If you don’t like a commenters point of view this new Comment system we have allows you to collapse their thread, So you don’t see the parent of any of the reply’s. I appreciate the commentary. I have not been able to watch the feeds very much this season and have relied on Simon and Dawg’s posts/updates. I enjoy the discussions and varying opinions. While I’m not the most tech savvy person, I do know how to scroll past a comment that doesn’t spark my interest. In appreciation, I am going to send another donation. It’s not a lot but hopefully, all the small ones you receive add up to make a difference. It’s worked for a few politicians! ? Thanks Cujo, I appreciate it. I do personally look for Granny’s posts, and enjoy her style of writing, and I definitely cringed at your how you made your point. That being said I can acknowledge the validity in your perspective and I appreciate that Simon and Dawg actively implement measures to allow everyone to be able to freely express their thoughts without stifling the conversation. But dang bro, you could be a little nicer, I like how well she consolidates her views and opinions of each guest and I feel as though that the attention her posts garners is a reflection of the thought that goes into each of her posts, rather than an intention to monopolize. Who schedules a cruise during BB season? Priorities people!!! After the last few seasons I could see why. After reading that, is Brett going home now? That really confused me when Tyler talked to Scottie. And started talking to someone about Brett’s pitch. 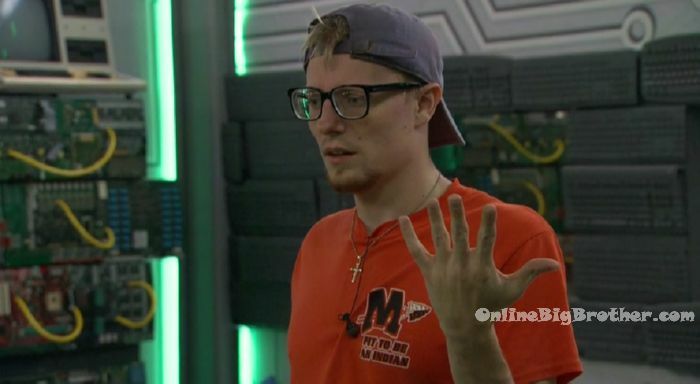 tyler wanted scottie and fes to believe he was 100% with them until the last moment conversation with rachel in combination with brett’s speech led him to the conclusion it was too dangerous to keep rachel. 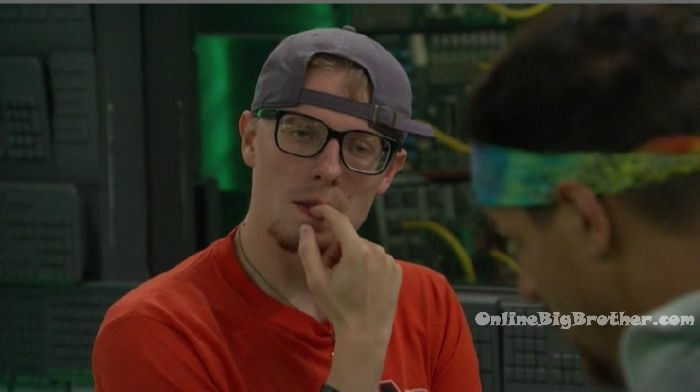 he’s creating an alibi so scottie and fes don’t believe he is in an alliance with the other side. Bay describing her power app. Let the debate continue! If Bayleigh, Fes and Scottie don’t realize that Tyler and JC always are the ones voting the other way after Brett stays this week, they need to self-evict. Their cluelessness is beyond annoying. I can’t wait for tonight, it’s going to be drama. Brett’s speech…..ahhhh I cant wait. This whole week should be interesting, I’m hoping L5 wins HOH and then Bayleigh’s power is used and then chaos ensues! Yesssss! That would be one of those moments memorialized in BB history. It would be comparable to going out on Survivor with 2 idols in your pocket! They know JC has gone the other way but Tyler has done a good job masking exactly where his vote ends up. true LOL they are so blind and they don’t deserve winning if they are gonna be clueless the entire game. I think you guys might be crediting Tyler a little too much. I get it, I like the guy, sure. But, from what I understand, even though Bailey has been blindsided time and time again, she knows where Tyler’s votes lie and know when that they have not been aligning with her best interest. It’s not even to say Tyler is actively trying to mist Bay. Before he can make something up to mist bay, she cuts him off and offers him an excuse to him. At first, I thought it was a game move. You know, keep your enemies comfortable and close. Then she shares her power with Rachel, and then I was like, “Wait, what.” As time went on, however, I realized what it could be! Top of my differential, Bayleigh meets all the diagnostic criteria of Narcissistic Personality Disorder! a brett win probably equals bayleigh using her power, which could be fun if she blows it and puts up scottie, but a tyler win is probably a better guarantee someone from bay’s side goes as she’d likely be blindsided. is it just me or does Tyler look like a stoner? Tyler is so good, stoners look like *him*. I love BBSniper’s comment. Tyler actually has said he’s never done any drug. The memory competition will be interesting. Hayleigh seems to REALLY want to win. In part, because she has heard her side go on about people not winning anything. Also has a shot in the eye to Fez. If Hay IS HOH…I think we will see a mini me Bayleigh. BB is going to throw some curve balls in this comp I believe. The fact that Scottie and Fez wrote things down. I think some of the questions are going to be a bit obscure. And…only a short time to write them down. Will Kay Cee shine? Or Brett? Something tells me Brett could win it. And…Oh what a nightmare that would be for The Hive. He would be the worst scenario for them. Especially Bay and Rocks. It’s not that Brett is my fave…but he is the go to guy to stir things up BIG TIME ! Simon/Dawg has B.B. ever prevented someone to play in a competition that cheated or went against the rules? It’s definitely an advantage to write things down vs just memory. The visual and process of writing answers has an impact on recall. Why Haleigh? She hasn’t done anything wrong. I don’t recall anyone being excluded from a comp for cheating. Although I’m not sure if there is a specific rule against writing things down. If they were instructed they could not, then I could see that as a logical consequence. I don’t think they will though. yeah, i can only recall penalties for violating have nots ever being enforced (other than the obvious getting disqualified from the whole competition incidents). lol he is a big one!!!! By enforce I am meaning tell him to stop and make it known to the house. I don’t mean kick him out. BBUK and BBAus always had good, effective punishments for breaking rules. Fes would break a rule and everyone in the house *except* him would be a have not for the rest of the week. Vicious. BBCan has disqualified contestants *during* a competition. I believe Emmett was disqualified during, like, 4 competitions or something. And then there was the classic James Rhine v Janelle nail break… “Harm! Harm! She’s torn off my finger! Harm!” Good times, those. One thing that really makes this season stand out is none of that “we’ll tell you last minute if your the one going BS” It seems like for two seasons straight everyone knew they were going which mad for boring speeches and eviction nights. Who told Bay about Brett’s speach? I’ve been trying to figure that out. I think Scottie but not sure how he knows???? Scottie is the one who told Brett he should blow up on Rachel while they were playing pool the other night. He then ran back to the hive and told them Brett was thinking of blowing up on Rachel. He omitted the part where it was his idea however. Brett for HOH this week = perfect Karma. RS and Bay go straight up, Bay changes it and whoever is blindsided by the veto goes home. Can’t wait. Is it this week or next week that the first person goes to jury? I want the Hives to win HOH cause I want to see L6 scramble again and throw one of their own under the bus. They’re bunch of pathetic fools. I want to see Tyler evicted next week.